Laser Engraving and Laser Cutting, What’s the Process? While most CO2 flatbed lasers can perform both laser engraving and laser cutting, there are some basic differences in the process and equipment requirements. 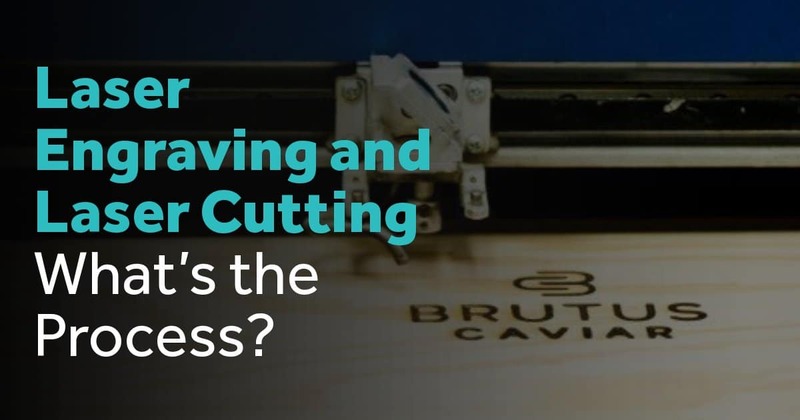 Let’s explore some of the similarities and differences in laser engraving and laser cutting of various materials. Laser engraving equipment is generally designed to be much faster and have smaller working beds. Laser cutting requires a slower and higher wattage machine with larger passthrough working beds. Laser engraving and laser cutting are thermal processes. Laser engraving most materials can be accomplished with lower wattage and at a much faster rate than the thermal separation process needed for laser cutting of the same material. Metal engraving of some materials does require more wattage, and, in some cases, special laser engraving coating solution is necessary to etch the metal surface. Laser engraving is accomplished by uploading a raster image such as a .png or .jpg to the laser engraving machine. The laser engraving machine then removes the surface material in the design pixel by pixel, much like how an ink jet printer prints the same image. Laser cutting is accomplished by uploading a vector file such as .eps or .ai to the laser cutting machine. The laser cutting machine then uses the line art to cut the object from the base material. Unlike laser engraving, laser cutting process is much slower and limited in the types and thicknesses of materials which can be cut. Do you have a laser engraving or laser cutting project? JW Machine has laser engraving and laser cutting experts ready to assist you in selecting the right process to get your project off the ground! Have a specific material? Our laser engraving and laser cutting specialists will be glad to test it for you!